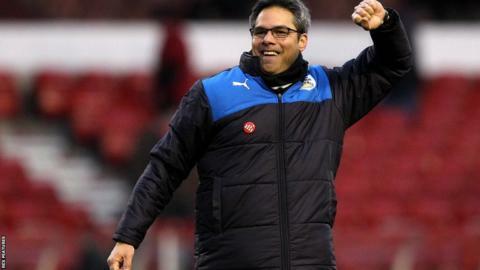 Huddersfield needed to make a "drastic" change when they appointed David Wagner as head coach, director of football operations Stuart Webber has said. German Wagner, 44, was appointed Terriers boss in November after the sacking of Chris Powell. "It was a massive risk but we felt at that point we needed to do something to drastically change," Webber told BBC Radio Leeds. "We needed to change the culture around the club." Webber added: "It had become a little easy for the staff and for the players." Wagner had previously worked with Liverpool boss Jurgen Klopp at Borussia Dortmund. The former USA international striker believes one of the biggest differences between football in Germany and England is the emphasis on analysing opponents. "The training schedule is different here and how you analyse other teams," Wagner said. "There is a lot of information and statistics, in Germany we are more focused on our own game. "Here you have the tradition of inviting the opposition's manager into your office after the game and that is different. In Germany the managers have the press conference together and maybe talk a little there. "Everyone has been welcoming. I like going into the office when I have won the game but not so much when I have lost but I think it is a nice tradition." Wagner said he was pleased with how receptive the players had been to his coaching methods, including double training sessions and training in the evening. "It's a big surprise for me that my lads were very open with me from the minute we started our work together," he added. "We have double sessions on Tuesday and mostly on Wednesdays as well and we'll train in the evenings if we have an evening game but this is normal in Germany. "That the players were so open-minded to start off with was very special and shows the good character in the dressing room. I think the system keeps going because they feel that they get better and get a benefit from the schedule and their hard work."